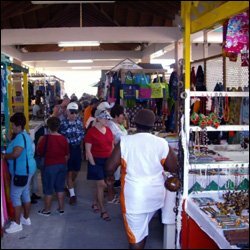 St. Kitts experienced growth of triple digit figures in its tourism industry between 2005/2006 and 2008/2009. A Florida-Caribbean Cruise Association report, not only found significant growth in passenger and crew arrivals and spending, but also a high degree of satisfaction by cruise passengers, friendliness of residents and courtesy of employees. According to the study, total estimated passenger and crew visits increased by nearly 250 percent from 113,300 visits during the 2005/2006 cruise year to 388,400 during the 2008/2009 cruise year. Total direct expenditures in St. Kitts increased even more dramatically growing by 550 percent from US$6.7 million in the 2005/2006 cruise year to US$44 million in the 2008/2009 cruise year. It said cruise tourism expenditures increased among all groups, passengers, and crew and cruise lines. The growth in passenger and crew expenditures in St. Kits was not only driven by the 250 percent increase in onshore visits, but also by the 73 percent increase in average passenger expenditures and a seven fold increase in the reported average crew expenditures. â€œThese are certainly significant increases and were among the largest estimated among those the 29 destinations that participated in both studies. The growth in per passenger expenditures varied across categories,â€ said the report. For example, during the 2005/2006 cruise year, passengers who purchased jewelry spent an average of US$144. This average purchase value increased to US$319 during the 2008/2009 cruise year. In addition the percentage of passengers purchasing jewelry also increased from 17 percent to 25 percent. In the case of visiting crew, the sharp increase in per crew spending is primarily due to an impressive increase in the percentage of crew reporting purchases in each category. â€œIn the 2006 study 34 percent of crew reported making an average purchase of US$23.20 for food and beverages. This increased to 42 percent reporting an average expenditure of US$36.40 at restaurants and bars in the current study,â€ said the report. Similar increases in the percentage of crew making purchases were reported in most categories. As a result of the 250 percent increase in direct cruise tourism expenditures from the 2005/2006 cruise year for St. Kitts, the economic impacts increased as well. The total employment impact increased by 268 percent over the three-year period, while the wage impact increased by 295 percent. The higher growth in wages is due to increased labor productivity and average wages over the intervening period. Of the 1,442 cruise parties that completed the surveys 87 percent stated that this had been their first visit to St. Kitts. Ninety-six percent (96%) of the cruise parties that completed the surveys disembarked their cruise ship to visit St. Kitts. Of the cruise parties that went ashore, 81 percent made at least one purchase while ashore. The typical cruise party consisted of 2.1 passengers and spent an average of 4.4 hours ashore. The responding cruise parties reported spending an average of US$162 while ashore (excludes shore excursions). Fifty-eight percent (58%) of the passengers that went ashore purchased a shore excursion. Seventy-three percent (73%) of passengers who purchased a tour did so through their cruise line, nearly 24% purchased their tour onshore and 3 percent purchased their tour through their travel agent. The typical cruise party that purchased a shore excursion spent $131 for their tour. The passenger survey also asked the passengers to rate their satisfaction with their destination visit along a number of parameters. A 10-point scale was used with 10 being the highest score, i.e., extremely satisfied, and 1 being the lowest score, i.e., not at all satisfied. Cruise passengers were very satisfied with their overall visit to St. Kitts with a mean score of 7.8. However, the visit did not score as high in terms of meeting expectations. The mean score for â€œVisit Met Expectationsâ€ was lower at 7.4. Passengers felt very informed about tours and onshore activities in St. Kitts with a mean score of 7.7.
â€œGuided Toursâ€ (or Shore Excursions) received the third highest score of all visit attributes with a mean score of 8.1. Thus, cruise passengers were very satisfied with their shore excursions. Passenger interactions with residents and store employees were very positive with â€œfriendliness of residentsâ€ receiving a mean score of 8.3 and â€œcourtesy of employeesâ€ having a mean score of 8.2. Categories with slightly lower scores but still above 7.0 (Very Satisfied) were: initial shoreside welcome, historic sites and local transportation. Only â€œvariety of things to see and doâ€ received a mean score lower than 7.0. The mean score for this category was 6.9 (Somewhat Satisfied). Passengers were also very satisfied with their shopping experience which received a mean score of 7.6. It was already noted that passengers were very satisfied with shop employees but they were also very satisfied the variety of shops (7.3) and overall prices (7.1). Cruise passengers stated that they were somewhat likely to return to St. Kitts for a land-based vacation. Residents of the United States and Canada accounted for 91 percent of the responding passengers. The average age of the respondents was 54 years with 28 percent of the respondents being 65 years of age or older. St. Kitts passengers had an average household income of $104,400 with 42 percent having over $100,000 in household income. I just wanted you to arrange a wonderful trip in st kitts. We are all from Ghana and we are 3 group of people and if you can help as visit st kitts for a tour package and transfer inst kitts. So i will you to help me so please keep in contact.